The first step is to export all portgroups with the corresponding VLAN numbers. I used the script below to define all the non NSX related portgroups and put them in an CSV file. You need to slightly adjust the script when you are adding Universal Logical Switches instead of Logical Switches, which are created in my script. As I mentioned earlier I used this script to adjust the naming convention. If you just want to create the Logical Switches based upon the current portgroupname you need to adjust the following option. 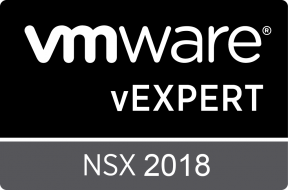 $NONNSXPG = Import-Csv '\pathto\export_nonnsx_pg.csv' -Delimiter ";"
$vlannumber = $vlanoctet -replace "$vlanvariable","$vlandelvariable"
In case you messed things up or it didn’t give you the outcome you had in mind you can use this script to delete all of it. Again, based upon the CSV file. $NONNSXPG = Import-Csv 'pathto\export_nonnsx_pg.csv' -Delimiter ";"
*Use these scripts at your own risk. Before apply it in a production environment, please test it thoroughly. If someone has recommendations, comments or other points of improvement. Please do not hesitate to contact me! Thanks for reading, and hopefully it might be useful for someone as well.